ART - just do it! : A bear with apples and a primary colour scheme! 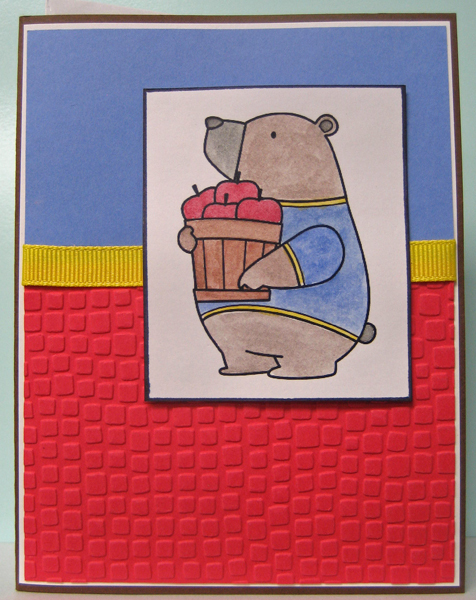 A bear with apples and a primary colour scheme! A few more cards for my stash!! I love this image of the bear with the apples by Birdie Brown which is laser printed on white cardstock and trimmed!! I also highlighted the edges with a black marker. The background features blue decorative paper and a red embossed panel with yellow gros grain where they meet with the ends glued to the back. This is mounted to a white layer and then to a brown card front. The image is watercoloured to coordinate with the background. No greeting makes this card versatile and appropriate for a fall birthday or a thank you card! !